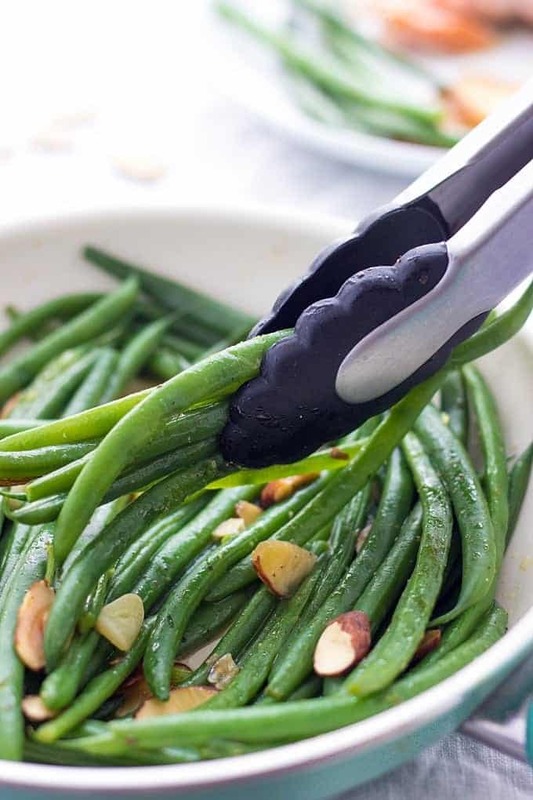 These easy Garlic Almond Green Beans take little time to prepare. In fact, you need 15 minutes from start to finish. They are cooked until tender and are flavorful, healthy and so good. Perfect side dish for any occasion. When I say the recipe takes only 15 minutes to prepare, I’m not exaggerating. 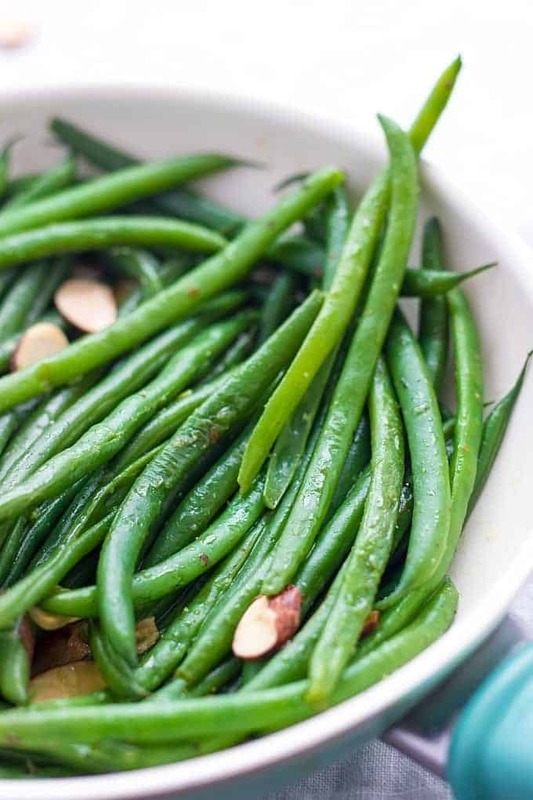 15 minutes is all you need to make tender, healthy and the best green beans ever. Here’s a thing. When it comes to green beans recipes that you can find around Internet, there is one problem…. …they are either severely undercooked and taste like grass, or they are so overcooked, that they loose all their healthy properties and vibrant green color. I have to tell you, for many years I was overcooking my green beans big time. It would usually take 30 or 40 minutes to roast them and I would always end up having too many overcooked brownish-like beans. They were edible though, but not something you would put on a table when you have guests over. 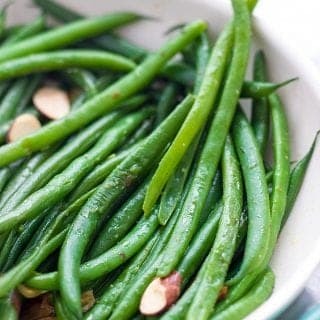 Recently, I discovered a way to make green beans fast, healthy and delicious. In addition, because cooking time is only 15 minutes, they don’t loose their pretty green color. Are you in? Well, I hope so:) Because, believe me, this is the only Pan Sautéed Green Beans Recipe you’ll ever need. Even your kids will like it. Georgian Salad With Mini Bell Peppers And Zucchini – easy 30-minute side dish perfect for chicken or steak. Roasted Brussels Sprouts With Honey-Balsamic Vinaigrette – easy to put together and great for any occasion. Easy Baked Hasselback Potatoes – classic Swedish recipe that requires minimum ingredients. This step is optional. Preheat the oven to 375 F. Place almonds on a baking tray and roast them for about 5 minutes until slightly brown on the sides. When all water evaporates, in the same pan melt butter, add sliced garlic and sauté for 1 more minute. Remove from the heat. Sprinkle with toasted almonds and serve. Don't forget to download my free European Comfort Food ebook. If beans are already nice and tender but there's still some water in a pan, simply drain it and proceed to the next step. If you make these Fresh Sautéed Green Beans, snap a photo and post it on Instagram with a #lavenderandmacarons.